If you are available to proctor on these days, please contact Mrs. Kelly Jones at (704)283-8520. Thank you in advance for your time! Welcome Walter Bickett Elementary Class of 2032! We are accepting Kindergarten applications for the Dual Language Immersion Classes! This is a great opportunity for your child to become bilingual and biliterate in Spanish. If you have a child who will turn 5 years old by August 31, 2019 you can begin the registration process. Enrollment starts February 1, 2019. Please call the office with any questions. We look forward to serving you! Please join Dr. Daniels & Mrs. Eley for Coffee with the Principals. We invite you to join us for breakfast with the Principals. This is an opportunity for conversation and feedback throughout the year. ***Attention parents of children who will turn 5 years old on or before August 31, 2019... It is time for Kindergarten Registration!!! Kindergarten Registration will be held at Walter Bickett Elementary School at 803 South ML King Blvd, Monroe NC 28112. Guided Tours: We are offering guided tours for parents to have an opportunity to visit the school and learn about the traditional and Kindergarten Dual Language classes. Listed in the link below includes the dates and timeframe. Please contact the school office if you should have questions. Click on the link below for more information. We look forward to seeing you! The Latino Outreach Program provides support to our Latino community through workshops on a variety of topics, including parenting skills, healthy living, higher education opportunities and immigration and tax issues. There is more information on the Quick Link section of our website. Every entity of Nursing has its challenges. School Nursing is no different. Ask any School Nurse what challenges they face and you will get a different answer from each Nurse. School Nursing is not all about bumps, bruises and tummy aches. Many physical pain comes from deeper within. Many complaints are actually from a hurting heart. 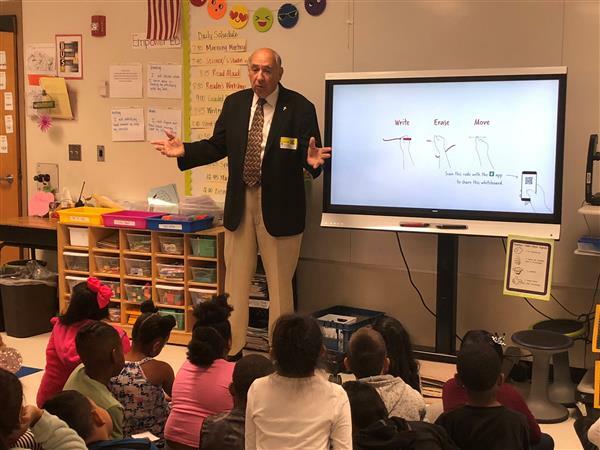 Today, the second graders at Walter Bickett Elementary School welcomed a special guest, Monroe’s mayor, Bobby Kilgore. Mayor Kilgore spoke with the students about city government and his role as an elected official. As part of the Hispanic Heritage month, two of our DLI 1st grade classes celebrated and learned about Honduras, the country where one of their teachers came from.